If you're receiving my blog posts via email, click HERE to read directly from my blog. I'm sharing a card that I made for several challenges. The challenge that really jump started this card is the Moxie Fab World Challenge - Keen On Neon. Rarely do I use neon colors on my projects/cards...but the inspiration that Cath provided was simply irresistible, so I just had to give it a try! 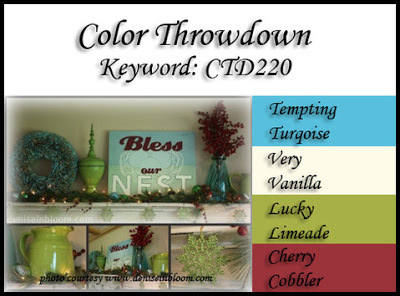 I'm using the colors from Color Throwdown CTD220. SO pretty, and perfect for going neon. Crazy 4 Challenges C4C #165 - Create a card that features a snowman. I recently saw a tri-fold card made by Julie Ebersole, on Ellen Hutson's Classroom. That card inspired me to make this card. I embossed the snowflakes in turquoise, citron and cherry after die cutting a window in the front of my card. From there, I knew where to place my die cut, snowman stamped, panel (matted in cherry). I colored the little guy's hat and scarf in cherry, also. Then added a bit of stickles to the pom pom and trim of his cap. I stamped a sentiment inside the card, on that center panel. This card was a little difficult to photograph. It refused to stay closed! You'll see in one of the photos that I got a little help from one of my snowman decorative figures. It worked! THis is just adorable! LOVE this little guy...and so cute in these colors, too! Thanks for playing with the Paper Players this week! How cute and clever! I love the non-traditional colors you selected for the snowflakes! Thanks for playing with The Paper Players! This card screams FUN! Fun colours, fun images, fun layout....perfect!!! Love the fun, colorful snowflakes in the background! Love the unique card fold as well! Thanks so much for playing along with us at Color Throwdown! What a darling trifold card. Fantastic! LOVE those bright snowflakes, and the trifold is such fun! This is just precious, Susie! Gorgeous card! Love the darling snowman and beautiful embossed snowflakes! Love the coloured embossing on the snowflakes - really lovely effect! Thanks for playing along with the Paper Players this week! 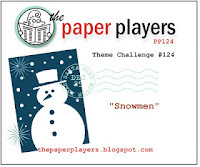 I always loved this little Stampin Up snowman. Isn't he just adorable? Love those bright snowflakes, too, Susie. Merry Christmas!